"Finding new family favorites "
I'm always looking for ways to engage their imagination through creative free-play, but don't want to fill our home with endless amounts of toys. I love the fact that we are able to explore so many high-quality, toxin-free toys from the diverse catalog. It helps keeps our playroom clutter under control, while also introducing fresh playthings into rotation on a regular basis. 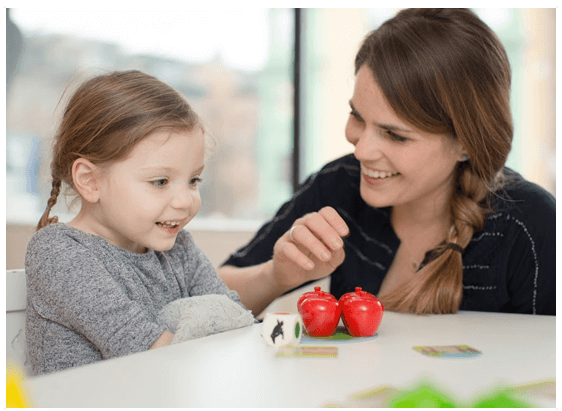 "Perfect for our small, city space"
As a busy mom, I love providing my daughter with educational, fun and safe toys but have a hard time keeping up with different toys that match her interests. We also live in the city so we keep our toys minimal with such a small space. Green Pinata solves all of those problems and my daughter loves each toy so much that we end up keeping most of them. Thanks Green Piñata! "Excited to find your service!" " Kids love the toys!" So far we love the service! The kids love the toys, I love the brands, and I HATE clutter so the idea that the toys go back and don't take up space or get lost in the house is amazing! "Great toys that keep my daughter's attention"
My daughter loved the toys! She’s at the age where she doesn’t play with anything for very long, but she was very excited about them when they came, and was especially interested in the cars and the blocks. And, I have 2 nieces that are 2 and 3 years old, and they LOVED the pull-behind alligator. "Perfect solve for our city apartment!" Wow, I love this business model. Just when my son starts to get bored, I can send the toys back and get an entirely new box of toys. Space is precious in my city apartment and I think Green Piñata is a perfect solve! "Green Piñata grows with us"
The reason I love GP for my daughter is that it provides diversity, novelty and keeps on developing while she does. Trying a subscription is maybe even the best tip I can give other (expat) Moms! "Loving the novelty of surprise toys with less waste"
I love the giddy excitement the girls have when they see the Green Piñata bag and their new toys (“YAY, A SURPRISE! !”) and I love not having to worry about the clutter and wastefulness of outgrown toys. I think there’s a great benefit to toddlers who move and grow so quickly to have age/developmentally appropriate toys to help augment their new skills! "No more bright, obnoxious toys cluttering our playroom"
Green Piñata makes it so that my son has only 4 toys at a time (all he needs) and I love that the toys look great and even have a sweet vintage vibe to them. When we're done and he's grown out of them, they go back and we get new ones. "Our daughter loves getting Green Piñata toys "
"Helps reduce our addition to landfill"
My favorite part about Green Piñata is that it encompasses two things I'm most passionate about – my children's health & well-being, and limiting our impact on the environment. It gives me great peace of mind knowing that my children can play with high-quality, educational, non-toxic, electronic-free toys, all while lowering our overall consumption of "stuff." Hi, I just wanted to say thank you to your whole team. We just received our latest box and yet again my children loved it.I have two toddlers, a year apart in age and being able to try new toys for both their age groups without constantly adding new clutter is AWESOME! Your team also included an extra toy when I didn't select four toys and both of my children ended up loving it so thanks again!